I had pizza last night. A huge, doughy, cheesy, greasy slice of Hawaiian pizza from some joint downtown. The Cave Man and I were out with friends, one thing led to another and BAM, pizza all up in my face. It was delicious. BUT (there’s always a but!) my body let me know it was not happy with that decision. I was in pain, bloated and felt like crap. Lesson learned! Stuff happens, and sometimes we fall off the Paleo wagon for awhile. We’re only human. You move on. Now back in my pizza eating days, I enjoyed grabbing a slice or two loaded with meat, veggies and cheese. 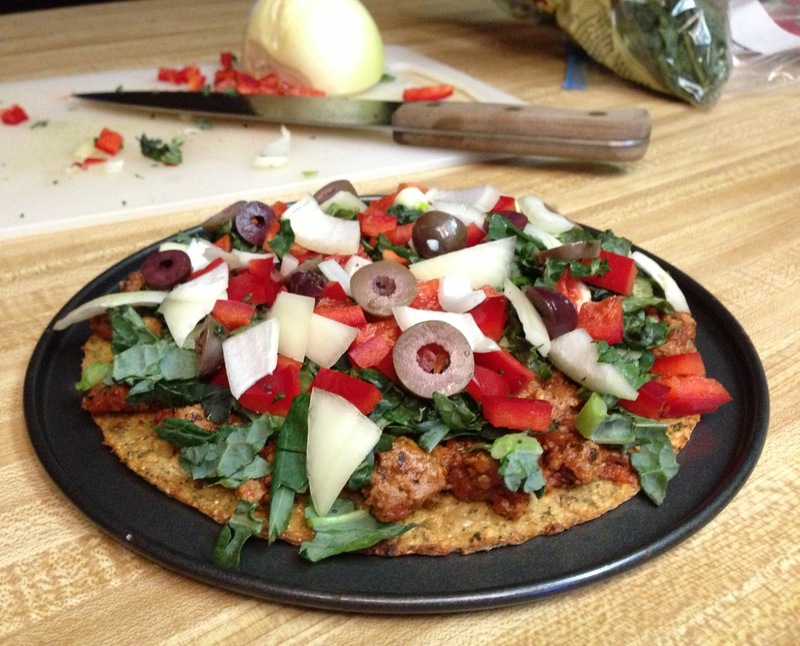 When I went Paleo, I wanted to create a pizza-like recipe (sans cheese) that would satisfy a pizza craving when it hit. I tried several different ‘meatza’s’ using ground beef as a pizza crust and topping it with a homemade sauce and whatever vegetables I had on hand. The Cave Man loved these experiments! I however, was not completely won over. 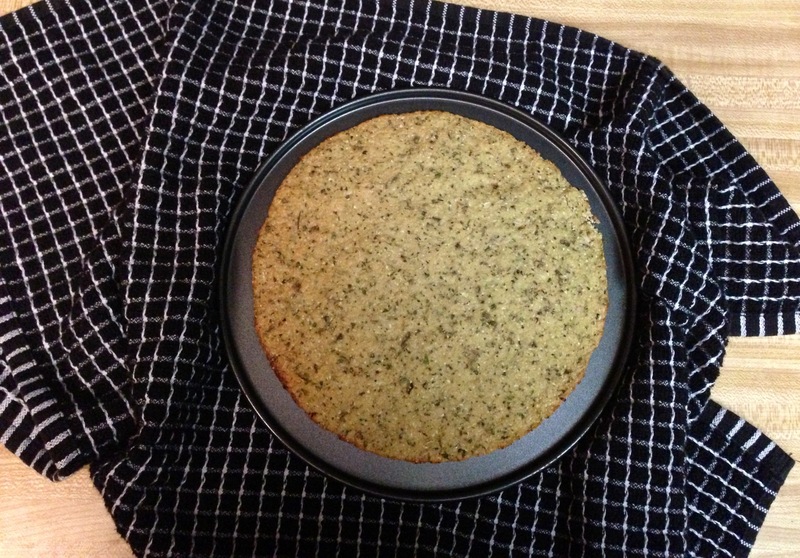 And so the experiments continued and I started playing around with gluten free crust recipes. Best idea ever. Can you guess the magic ingredient? Cauliflower. GENIUS. coconut flour – as needed. See below. Process cauliflower in a food processor until the it resembles a rice-like texture and is almost mashed. 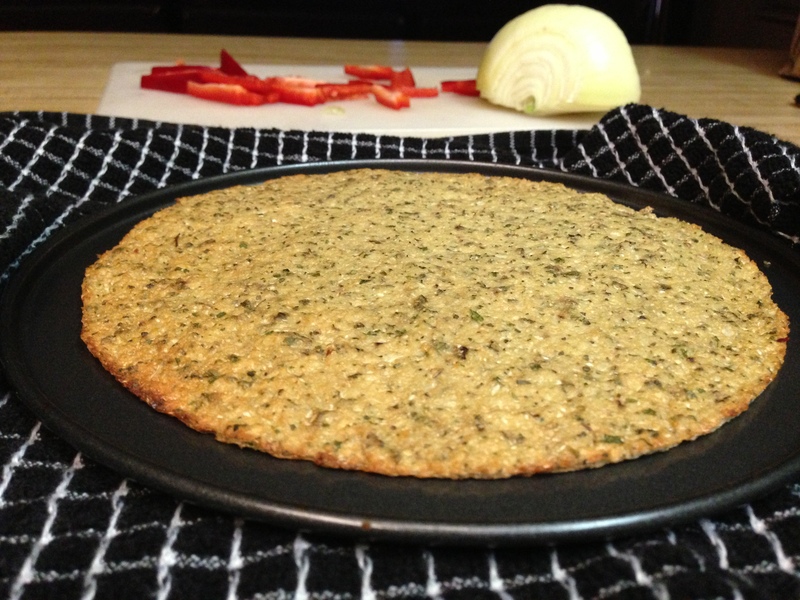 Combine the cauliflower, egg and seasonings in a medium size mixing bowl until a dough is formed. Add coconut flour to the dough as needed – you don’t want the dough to be too wet. I usually use approximately 1/4 cup of coconut flour to soak up any excess moisture. Spread mixture on small pizza pan (I actually used the removable bottom piece of a 9’’cake pan, and it fit perfect) Bake at 350 degrees (177 C) for approximately 40 minutes or until the crust is a beautiful golden brown. Optional Add In: crumbled feta cheese. If you tolerate dairy, I highly suggest you include this. Saute diced onion in medium size pot with olive oil. While onions are sauteing, blend the can of diced tomatoes in the food processor. Add to pot and let simmer. Brown ground beef and lamb in a skillet over medium heat, and then add to simmering tomato sauce. Add spices and let simmer for up to 30 minutes. 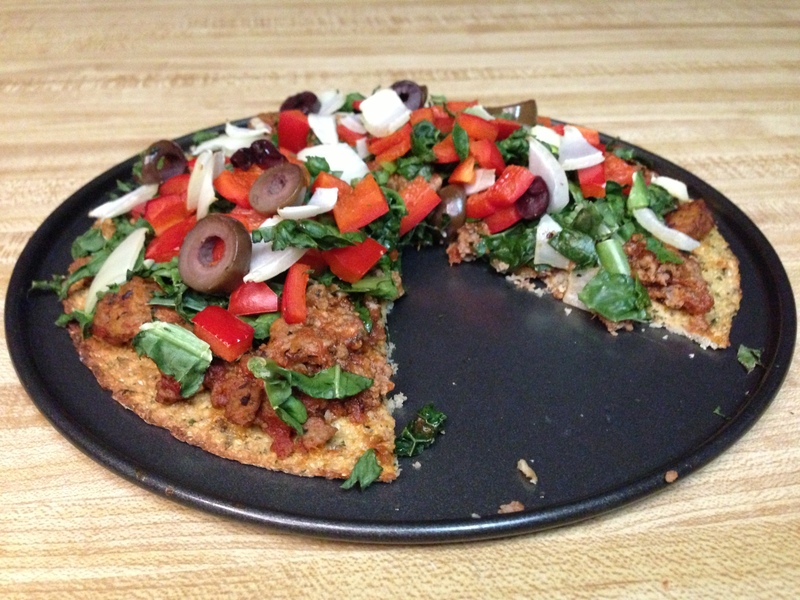 Spread meat sauce on pizza crust and top with kale, bell pepper, onions and kalamata olives in that order. Bake in oven at 350 for 10 minutes. Serve while hot, or if you decide to add crumbled feta cheese, let the pizza cool for 10 minutes before adding the topping. This pizza screams “eat me!” And it’s a personal size pizza so you don’t have to feel guilty about eating the whole thing…right? Right.